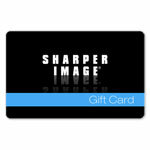 Add some cool to your pool! 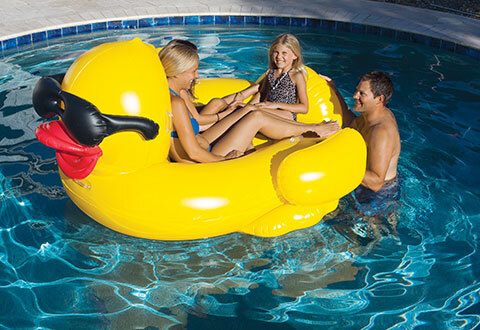 The Giant Rubber Duckie Float will have your friends "quacking up" with laughter. It's the ultimate inflatable for fun at the pool, with room for 1 or 2 riders (up to 175 lbs. total), built-in cup holders and four handles for safety. You can even place him on dry land to use as a poolside lounger. Made with heavy duty vinyl for loads of splash-splashing fun in the sun. 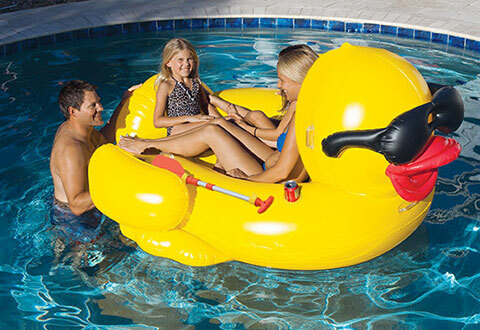 The Giant Rubber Duckie Float adds some cool to your pool. It looks just like your favorite bathtub companion... only much, much bigger! • Dimensions: 66” L x 51" W x 42" H. 6.2 lbs.